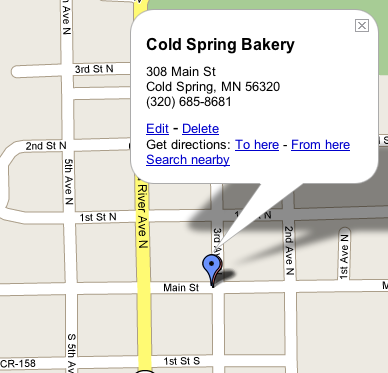 The Cold Spring Bakery was started by Melvin and Floss Schurman, in 1946. They are a full service bakery. Some of their produce include: buns, cookies, cakes, breads, donuts and many other types of pastries. They also specialize in cakes, whether it be a wedding or other special occasion. Their products are delivered all throughout central Minnesota; mainly Watkins, Eden Valley, Paynesville, Spicer, Willmar, Sauk Centre, Avon, St. Joe, Litchfield, Dassel, Howard Lake and St. Cloud.